Gatherings are concerts for anyone interested in the many genres within the realms of Space, Ambient, Electronic and Ethereal music. The events provide a rare opportunity for the members of our diverse community of Spacemusic enthusiasts to mingle with each other and to experience this music performed live. 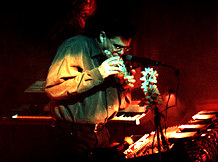 Gatherings have featured performances by a range of innovative artists; the techno-tribal journeys by Steve Roach, glurpy explorations by Robert Rich, multi-layered melodies from Jeff Pearce, the interface of earth and sky with Jonn Serrie and Gary Stroutsos, floating spacemusic of Spacecraft, the ambient chamber sound of Tim Story, the ethereal flutes of Coyote Oldman, and the world fusion of Steve Tibbetts and Choying Drolma. Legendary electronic music innovators such as Richard Pinhas, Kit Watkins, David Borden and Hans-Joachim Roedelius have graced The Gatherings, along with carefully chosen artists just starting to make their mark. The goal of the series is to bring interesting and challenging music to our community while providing a context for rewarding experiences for performer and listener alike. 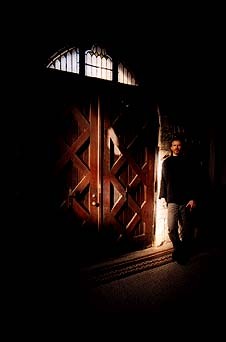 The Gatherings concerts are presented in the church sanctuary of St. Mary's Hamilton Village at 3916 Locust Walk, on the campus of the University of Pennsylvania, a serene space ideal for experiencing atmospheric sounds of spontaneous creation. Please move to the "Gatherings Archives" for an overview of the series. Soon to be accessable from this page will be "The Scrapbook", an area devoted to candid snapshots of the audience and artists who've come to Philadelphia to experience one of our many concerts of innovative music. Please check back from time to time as the area is still growing and will soon have more images for you to view, maybe even one of yourself or someone you know. The first event in The Gatherings Concert Series took place somewhat unceremoniously in a small room on the Penn campus back in May of 1992. That night, a group of local Spacemusic fans got together to meet, socialize and experience a live concert together; not realizing that they were in attendance at the inaugural event of what would later prove to be North America's most significant series of Ambient and Spacemusic concerts. It is now over ten years on and over the course of this time the Gatherings series has grown in scope and stature, attracting enthusiastic and informed audiences to dozens of compelling performances by the world's most innovative musicians. What has not changed in this time is the purpose and meaning of these events. The Gatherings Concert Series remains the place where an otherwise fragmented people can actually experience the benefits of community and be together for, present at and somehow part of the creation of a singular musical experience. For the musician, it is a safe haven where they can practice their mysterious electronic art, focus on the music and enjoy a rare and intimate connection with their audience. The reverent space, the attentive audience and the support of the organizers all act to allow the artist to reach their full live performance potential - to be the best that they can possibly be. The Corporation for Innovative Music and Arts of Pennsylvania was established on 7 January 2002. "CIMA of PA" is the all-volunteer, non-profit organization responsible for organizing and producing The Gatherings Concert Series. The basic mission of CIMA is to bring innovative music concerts to the public and further the advancement of this artform. On 18 April 2003, CIMA of PA filed Form 1023 (Application for Recognition of Exemption Under Section 501(c)(3) of the Internal Revenue Code) with the Internal Revenue Service. On 9 February 2004, the IRS determined that The Corporation for Innovative Music and Arts of Pennsylvania is exempt from federal income tax under section 501(a) of the Internal Revenue Code as an organization described in section 501(c)(3). During the advance ruling period, CIMA of PA will be treated as a newly created publicly supported organization. Donations to CIMA of PA are deductible as charitable contributions on the donor's federal income tax return. "The closest thing I have found to the strong festival scene in Europe has been here in Philadelphia where there is a heritage of support for our music. The individuals behind The Gatherings series have built the most significant point in America for this type of music. They've done it own their own and are not connected to any festival scene or academic situation or any particular heavy concept beyond the fact that they just want to present music from an essential place, not only electronic music but new and innovative music, music that people deserve to hear. I don't see a scene in The States with any real momentum outside of The Gatherings Concert Series". 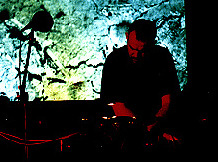 Vidna Obmana 4 November 2000 "Something exceptional and unique occurs at The Gatherings in Philadelphia, something which I have hardly ever encountered in the past 16 years of performing music live before an audience. While I am accustomed to the rather introverted response of European audiences, as well as the overall enthusiasm of American audiences, my experience at The Gatherings is truley overwhelming. The gracious reception of the audience attending this series of concerts, the sensitive choice of venue along with the respect and insight of the organizers all combine to create an inspiring, safe environment. It is fascinating for me, as an artist, musician and as a human being, to feel all these positive influences acting. It brings out the best in me". "As someone who has never felt very comfortable playing my music live, I didn't know what to expect with my first Gathering. What happened was a warm and loving reception from an audience that really wanted to hear music that moved them. There's not much more that a musician could ask for. The supportive atmosphere created by those in attendence was unlike anything I've ever encountered- the audience was creating a reverent and respectful space for me to present my music. I'm thankful for all involved with The Gatherings, because they have encouraged me and provided a wonderful place for musicians and their audience to meet each other." 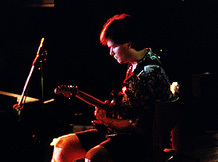 Kit Watkins 10 March 2001 "It was an extraordinary experience for me to play The Gatherings. The setting at St. Mary's Church was a perfect complement to the music I presented. This was my first performance in almost 20 years and I couldn't have asked for a more appreciative audience. Chuck van Zyl set the mood for the evening with his eloquent introduction. 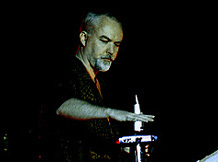 He spoke of the isolation that many electronic artists experience when creating their music, and how through these concerts, they are able to connect directly and in a much more compelling way with the listeners. That was so true for me, and I found the entire event incredibly affirming. The Gatherings are truly filling the void and bringing the artist and the listener together in a most positive way."